Monday, 8 February 2010 AFP Fail to Establish Which Gun Shot Reinado - Tempo Semanal accessed a highly protected Australian Federal Police (AFP) document today after an AFP officer attached to the Australian Embassy in Dili presented himself to the Dili District Court in relation to the attempted murder of President Jose Ramos Horta in February 2008. 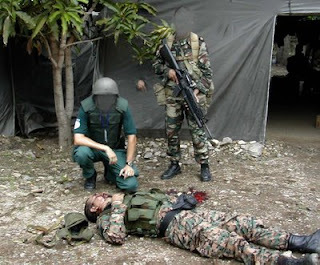 The AFP report on its findings and investigation into the events surrounding the shooting of President Ramos Horta and the death of fugitive Major Alfredo Reinado was dated 28 April 2008. The Brisbane Office of the AFP was allocated responsibility for investigating potential offence in Australia or by Australians in relation to the shooting of President Jose Ramos Horta, the attack on Prime Minister Xanana Gusmao and the death of Major Reinado. The AFP conducted computer forensic analysis of five (5) mobile SIM cards and three (3) mobile phone handsets located at the crime scene. The AFP did not go into detail but the second AFP forensic ballistic investigation/examination of the weapons, ammunition and spent bullets at the crime scene reveal much. Two (2) AFP officers deployed to Timor-Leste are Office Diggle and Officer Alex Caruna. The AFP fail in their mission to reach conclusive evidence. "Their examination have not been able to establish which firearm type was used to shoot (and kill) Major Reinado". Image added by ETLJB: The body of Major Alfredo Reinado lies in the compound of the Presidential residence in Dili after he was shot at point blank range according to the AFP forensic report.